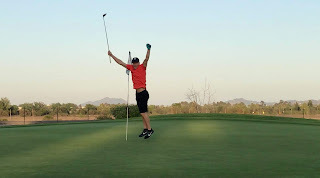 Following is an account of how I prepared for and twice broke the Guinness World Record for the fastest single hole of golf ever played (minimum hole length of 500 yards.) 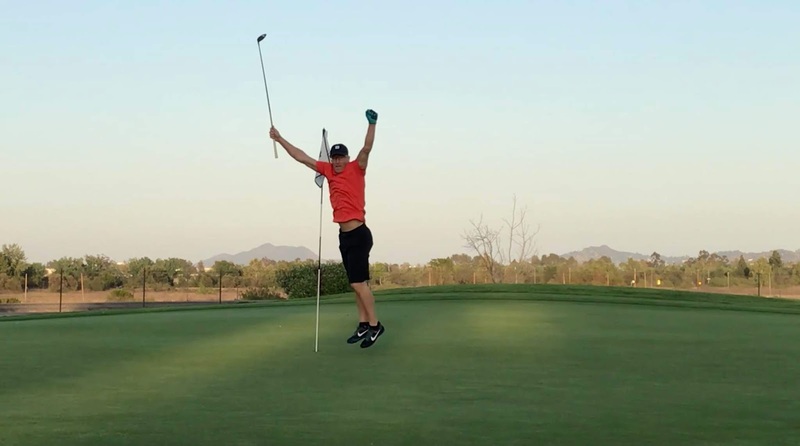 On May 8th at Bing Maloney Golf Course in Sacramento, CA, I broke the previous record of 1 minute, 50 seconds, with a performance of 1 minute, 40 seconds, scoring a bogey six on the 503-yard, par-five ninth hole at Bing. 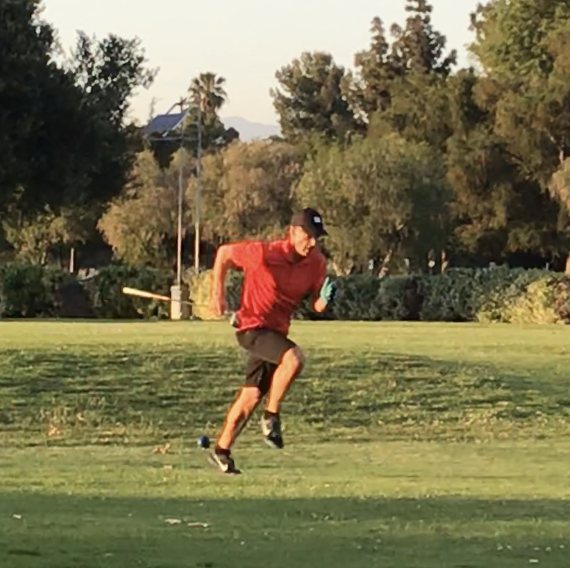 On June 1st, 2018 at the Woodley Lakes Golf Course in Van Nuys, CA, I beat my previous record with a time of 1 minute, 38 seconds. I scored a birdie four on the 503-yard, par-five fourth hole. In late 2017, I stumbled upon this awesome YouTube video of British Speedgolfer Steve Jeffs breaking the Guinness World Record for the fastest golf hole. Dig the 161,000 views (okay well, 1,000 of them are mine, but still…pretty viral!) and the dog pile celebration at the end. Jeffs did a 1:50 to beat the old record of 1:52 at his course in England. I didn’t even know that this record existed! It was a perfect opportunity to blend my two favorite fitness activities of sprinting and Speedgolf! However, Speedgolf tournaments are contested over the entire 18-hole course. Competitors carry a handful of clubs and run at a good pace while shooting good scores. A player’s minutes and strokes are added together to produce a total Speedgolf competitive score. For example, my best tournament performance, a 3rd in the 2017 California Speedgolf Professional Championships, was a score of 78 in 45 minutes = 125 Speedgolf score. This fastest single hole world record endeavor is an entirely different beast. Rather than running at a steady pace for ~5.5 miles during a Speedgolf tournament, the athlete is compelled to run an all-out sprint for a single hole of 500 yards minimum length. Pretty simple - the score doesn’t matter (but it does…details follow), and you start the clock when the first shot is hit and stop when the putt drops. The day after viewing the video for the first time, I went out to the ninth hole at Bing and made what I thought was a very good informal attempt. I was shocked to see a finishing time of 2:12—a full 22 seconds slower than the record! I tried again the following week, running faster this time, and threw down a 2:13 - this time due to a crooked shot here and a missed putt there. After these dry-runs and exchanging emails with Jeffs, I realized this was an extremely impressive record. Jeffs informed me he practiced his chosen hole hundreds of times to hone his fitness and shot sequences. One club: Developing the ability to compete the hole with a single club improves running speed from carrying multiple clubs, negates the need to carry a cumbersome bag (even a small bag will slow down your sprinting significantly), and also eliminates the need to drop and retrieve clubs from the ground after each shot. However, it adds a significant degree of difficulty to be without a trusty wedge for short approach shots and a putter to sink putts. I chose to attempt the record with just a three-wood. This is great for the first two shots, but very difficult for a short pitch shot and for putting. For the third shot onto the green from a probable distance of 10-40 yards (depends how well the first two shots are hit), an abbreviated three-wood stroke is going to produce a screaming grounder - far more more dicey than using a wedge to hit a shot in the air and landing it softly onto the green. Hit the grounder too softly and you are stuck in the grass short of the green for another delicate attempt. Hit it even a tiny bit too hard and it hits the green too hot, sails quickly past the pin and off the back of the putting surface. Death to a record attempt in either case. I got frustrated a few times during practice sessions because the single club technique is so high risk. Thanks to Alex Kampmann for the original idea, and Mark Sisson, and Christopher Smith for encouraging me to keep at it and stay committed to my strategy. Straight line approach: The fatal mistakes for this record are to hit a shot offline into the rough, or to hit a shot past the pin, which unnecessarily lengthens the hole. It’s absolutely essential to stay close to the tangent line from tee to green with each stroke. While you can’t be too conservative on a world record attempt, hitting a shot straight but a little short is not a deal breaker like a long or wide shot is. Do or die: Guinness record rules allow for multiple attempts, but truthfully the first attempt at an all-out sprint will be significantly faster than successive attempts due to fatigue slowing running speed. Try running the 400-meter dash at a track meet over and over! Not happening. For a record performance, a do or die mindset would be essential. Go all out on the first try and hold nothing back! Be quick, but don’t hurry: I trained myself with repeated practice to hit my shot almost immediately after arriving to the ball—one to two seconds pause only. In Speedgolf tournament rounds, you run at a good tempo between shots, but it’s customary to reach the ball, drop your other clubs, take a couple deep breaths, take careful aim at target, and swing when ready. This precious 5-7 seconds (or more) wastes valuable time on the single-hole record. Let’s face it, you are not going to catch your breath after a full sprint of ~240 yards even if you wait 10, 15, or 20 seconds. Through repetition, I made myself feel comfortable hitting a full power three-wood shot, or a delicate, soft-wristed pitch shot, or sinking a pressure putt, with my chest heaving and my heart pounding in my throat! However, I also had to train my brain to immediately transition from the frenzied aggressive mindset of sprinting into a calm, focused state prior to striking the ball. In the video you will see that I break stride ten yards before arriving at my ball each time to gather myself. This technique honors the late John Wooden, legendary UCLA basketball coach, prolific author, and pyramid of success creator. His frequent admonition to his ballplayers: “Be quick, but don’t hurry.” Trivia: the Woodley Lakes Golf Course is about a mile from Wooden’s longtime residence in Encino, CA. Context specificity: Christopher Smith of Eugene, OR, perhaps the greatest Speedgolfer of all-time, Nike Golf consultant, and also top-100 ranked teaching professional, coined this term to describe the absolute necessity of making practice effective and meaningful by simulating your competitive environment as closely as possible. Smith relates that banging balls on the range to hone your swing is an overrated component of becoming a good golfer, and is vastly different from hitting the assortment of shots during a golf round. Similarly, sinking twenty short putts on the practice green is great for honing your stroke mechanics, but has little to do with sinking a four-footer on the final hole of a tournament. This is why we still see the world’s best professionals choke routinely. In Smith’s interesting golf instruction/life philosophy book called, “I’ve Got 99 Swing Thoughts, But ‘Hit The Ball’ Ain’t One,” he cites brain research revealing that a different part of the brain lights up on MRI imaging when you are casually practicing versus when you are asked to perform under pressure. Yes, you are stroking a three-footer on the practice green, just as you might on the final hole of a big match, but it’s literally not the same exercise to your brain. Similarly, shooting 50 free throws in succession or delivering your presentation in front of the bathroom mirror is going to have a minimal crossover application to the real deal. This concept was never better evidenced than by the famous Caddyshack scene when Rodney Dangerfield’s character (Al Czervik) yells to Ted Knight’s character (Judge Elihu Smails) as Smails address his ball on the first tee. “A hundred bucks says you slice it in the woods.” And of course Smails slices into the woods. And refuses to pay up. Smith is also not a big fan of golf instruction (how’s that for a guy who teaches golf for a living?! ), and prefers that golfers relax, enjoy their walk in nature, and hone and trust their natural tendencies instead of obsessing upon the perfect swing. If you are not yet acquainted with the amazing sport of Speedgolf, you must check out this fabulous high-speed video of what in my estimation is one of the greatest golf rounds of all-time. It’s Christopher shooting a four-under par 68 in 53 minutes at the world-renowned Bandon Dunes, OR, Golf Course. Smith was instrumental in keeping me focused and confident in my months of preparation for the record. It’s easy to get discouraged trying to become a magician with a three-wood, but he urged me to stay the course and continue to put myself under pressure situations in practice. In my practice sessions, I simulated over and over hitting sprinting up to my ball on the fairway and hitting quickly. I practiced the delicate and wristy short distance grounder with a three-wood on my chosen hole (after sprinting up to the ball of course). Surely, casual golfers at Binge wondered who this guy was slapping three-wood shots and repeatedly sprinting up to the 9th green in the dark all winter! I also started putting exclusively with a three-wood, even during regular Speedgolf rounds, so my brain could form the strong association of my three-wood as my putter. While it’s far too strenuous to make a dry run record attempt more than occasionally, I did put up a 1:47 one night at the 9th hole at Bing. That was under the official record, but of course nothing like doing it under pressure with a full crew per Guinness guidelines. Perhaps the most daunting and pressure-packed element of all is to arrange for ten people to come out and support your record attempt. Guinness rules are very exacting: First, a 12-week application process before you are even approved for an official attempt, then the attempt guidelines require two official timers, two independent witness, including an expert witness, who have no vested interest in the record attempt, video footage of the entire record and photographic evidence of each shot along the way. For both the Sacramento and Los Angeles record attempts, I had to arrange for approval from the golf course, secure cart rentals for timers, photogs and spectators, and rally the dream team of supporters to appear just before sunset. Furthest traveled award goes to Shawn and Maria Watts, driving three hours each way to Sacramento for the May 8th occasion. Talk about pressure—you don’t wanna send home the dream team empty handed! My first attempt on May 8th was a 1:40, ten seconds under the existing record! I scored a bogey but kept the ball straight and short of the hole each time. I ran very well and was pleased to take that much time out of the old record. However, I hit a poor second shot (offline but luckily hit a tree and bounced back into the fairway) and a poor third shot (from 80 yards out it only traveled 50 yards). It didn’t cost me much time to hit an extra shot up to the front fringe of the green, and then two more excellent putts into the hole. I made two more attempts just for fun that night. The second attempt was two perfect shots that almost reached the green. The third shot nearly went into the hole, but I choked and missed the short putt, then missed the comeback putt, then missed again! Whew. I was also informed that despite the vastly superior first three shots, I would have finished in about the same time even had I made the birdie putt, because I sprinted much slower. I submitted the footage of the record performance and the sworn timer and observer statements to Guinness and awaited a 15-week approval process. In the interim, my competitive juices started flowing again and I wondered, “what if?” What if I hit a succession of perfect shots on an initial full-sprint attempt? Perhaps I could take the record down further? I also wanted to make an attempt in front of family and friends in Los Angeles, so I arranged for another attempt on June 1st, 2018. I had only one practice session on my chosen hole at Woodley Lakes Golf Course prior to the record attempt, but it’s all about hitting good shots, not memorizing every grass blade. On the record attempt, everything went to perfection as I hit a straight drive, a straight second shot to about 20 yards short of the green, and then a perfect third shot that raced through bumpy grass, poured onto the green and finished about six feet from the hole. With this much success in the bank, I carefully strided up to the final shot, taking care to be deliberate and hit a nice, square putt—which dropped for a birdie 4 and a time of 1:38.75! As revealed in the video, I was quite satisfied with this performance and welcome all attempts to break it. It’s gonna be tough. 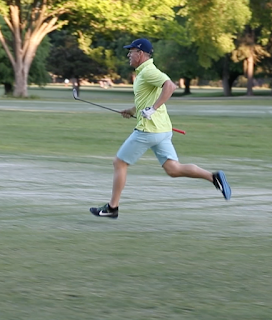 Granted, the sport of Speedgolf has some elite runners who are significantly faster than I am for a 500 yard sprint. New Zealander Nick Willis is an Olympic silver (2008) and bronze (2016) medalist at 1500 meters. He is one of the fastest milers of all time and an excellent Speedgolfer with multiple top-20 finishes in the Speedgolf World Professional Championships. Mac McLain reached the #1 world-ranking in Speedgolf in 2018 and is a former collegiate champion at 1500 meters - another sub-4 minute miler out there with some legit golf game! Alas, lot’s of work is required to take this thing down with an official Guinness-approved attempt. The most enjoyable aspect of the experience was sharing it with family and friends. I was truly touched and honored at the support I received, and you can see the credits to both dream teams at the end of the video. Through this challenge, I learned the value of a methodical and strategic approach to a peak performance goal. This is not always my strength, especially as a triathlete where I chased money and recognition across the globe, occasionally in a haphazard manner. I was patient through the record approval process, honing interesting new skills like three-wood pitching and putting. This was a stimulating challenge and a refreshing break from playing regular Speedgolf with my usual five club arsenal. I honed my sprinting abilities with workouts and extensive technique drills on the track (including taking a few simulated golf swings right after every sprint), a handful of informal all-out attempts at the golf course over several month’s time, and lots of short sprinting as I practiced the final few shots near the green over and over at the end of each Speedgolf outing. Mind you, all this practice on the course happened just prior to darkness at Bing Maloney and other courses so as not to disturb other golfers playing regular golf. As I mention on two podcasts I recorded for my new show (launching in summer 2018), there is tremendous value in cultivating a competitive edge and pursuing distinct peak performance goals throughout life. This crazy Guinness pursuit kept me honest and focused for many months. That said, my career as an elite professional triathlete ended 23 years ago, and today I try to align my competitive mindset to my age (53) and other responsibilities and realities of daily life. It was great to devote a decade (I raced on the circuit from ages 21-30) to an extreme and narrow focus on peak athletic performance, but it’s always healthy to move gracefully into the next stage of life and recalibrate your goals accordingly. An important clarification: While this Guinness record pursuit was certainly not life or death and had no economic consequences, I hesitate to say it was “just for fun.” Every minute of the process was indeed fun and rewarding, but this pursuit was more than just for fun, it was for personal growth and a catalyst to leverage the focus, discipline and risk-taking required in athletics into other areas of life. The greatest happiness and fulfillment in life come when you cultivate and express passion, curiosity, enthusiasm, and pursue the highest expression of your talents without compromise or excuses. The trick is to keep things in perspective such that you cultivate a pure motivation for your peak performance goals—a deep appreciation for the process, and release your attachment of self-esteem to the outcome. we providing the most premium professional Karachi Escorts services to the people whose expectations are really very high and they require something Unique Get the quality Service and the best Models form our Agency Escorts in Karachi if you are willing to enjoy the company of the Hot girls tonight or any other day.